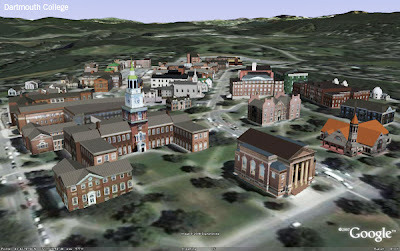 I'm pleased to announce the launch of the Google 2008 International Model Your Campus Competition! We’re back with another opportunity for you to show off your 3D modeling skills -- and this time students around the world can compete. This spring, you (and your presumably equally artistic friends) can honor your home turf and hone your 3D design skills by entering Google SketchUp's 2008 International Model Your Campus Competition. Simply model your school's campus buildings in Google SketchUp, geo-reference them in Google Earth and submit them by uploading to the Google 3D Warehouse. You may enter this competition if you're a student at a higher education institution almost anywhere in the world. Team up with other students, or take the project on yourself. The winners will earn everlasting online glory, and will each receive an Apple iPod Touch, a Nintendo Wii Console, and a Google t-shirt and hat. Our panel of judges include Ken Tse, from HKS Architects, Susan Koenings, from Callison Architecture, and Jeff Winston, from Winston Associates. Entries are due by June 1st, 2008. Check out what last year's winners modeled to get inspired, then visit the competition website to register. The image at the top of this post shows work done by members of last year's Dartmouth College team, who were among the winners of the 2007 competition. Good luck and happy modeling. Nice one, I'll be sure to enter my uni! Let's see ... so, you mean to say that anyone who enters can win a $300 iPod Touch for, gosh, well; maybe a little more than $300 worth of time and effort? Where do I sign up! Well, if Sketchup would run on any of my systems, I might give it a shot. Since it still doesn't support Linux, I still can't run it. Considering the market value to have such a model created, it's a complete giveaway to google at the modelers expense. It sure is a clever way to solicit free services from mainly college students. Hey Google, why don't you just pay for 3D modeling services. Come on! Lighten up you guys! If you think the time invested into making the model is not worth it, then just don't enter the damn competition. I can never figure out people who want to complain about something that is optional and whine that it isn't a fair deal. If you don't like it, don't do it. Jeez. Having said that, I think it is a wonderful opportunity to give students an authentic, real world task to do, that will give them worthwhile understandings of math, geometry, measurement, design, etc, and the opportunity to do something that many of them would willingly do in their spare time anyway. The prize is just a bonus if they win something. You know, sometimes it's worth doing things just for the intellectual challenge of doing them, even if the financial return is not apparent. I would venture to say that any student who enters this, learns a lot in the process, and applies it other areas of their life will get way more than $330 worth of value out of it in the longer term. I was a member of the University of Minnesota team that competed last year. Seven of us worked for 10 days, and were fortunate enough to be one of the winning teams. We did it as a part of a May Term class, and most of us had experience with SketchUp. Several of the other teams had little experience and had no incentive to put in the effort, but they did. Google was treated us all wonderfully, truly a first class bunch of people! I love the idea and I am pushing my university to endorse the competition. I think there should be another level to it though so that the modelers can mark each classroom and building in a searchable way. This would be great for new students who could search for the locatoin of their next class and have it pop up in 3D. I think this would have to be a new feature built into SketchUP. I wonder how hard this would be?